I don’t like the title. I think we ought to use “theater” and not “theatre”. The play was fine and nicely done. It was definitely a big-bucks production with the stage set carrying a lot of the burden of the storyline. Well, there’s really no storyline at all. Just an excuse for a great stageset and lots and lots of singing. But, I also liked the theater itself. 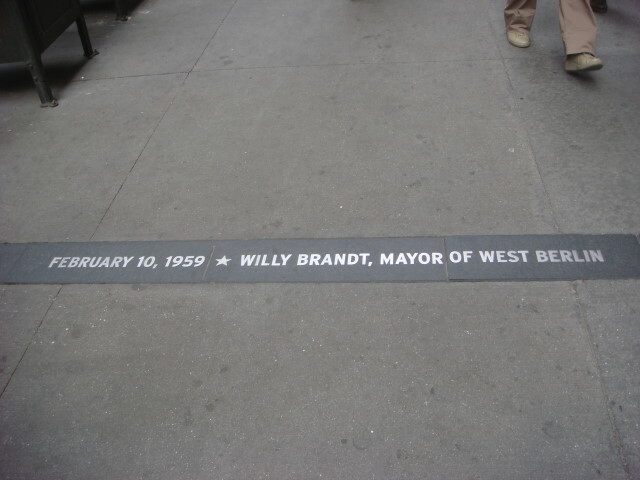 It’s located on 42nd Street, just off Broadway. 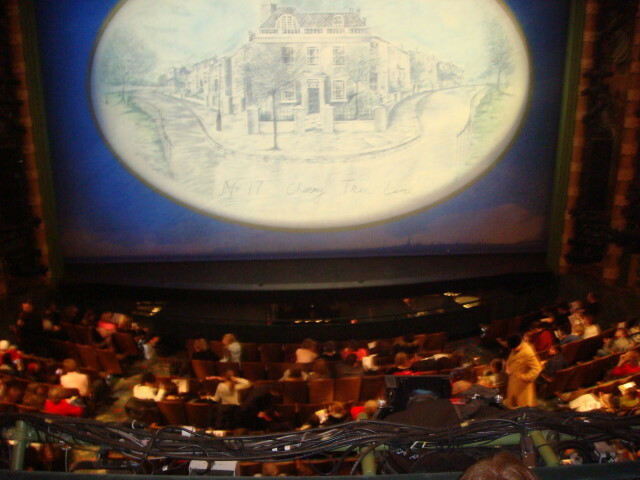 I did manage to get an inside shot of the theater. A co-worker alerted me to a new production of Shakespeare’s Romeo and Juliet. So, I thought I ought to go. And when I heard who was doing it, I really knew I must, absolutely must, go. It was TBTB, the acronym for Theater Breaking Through Barriers. 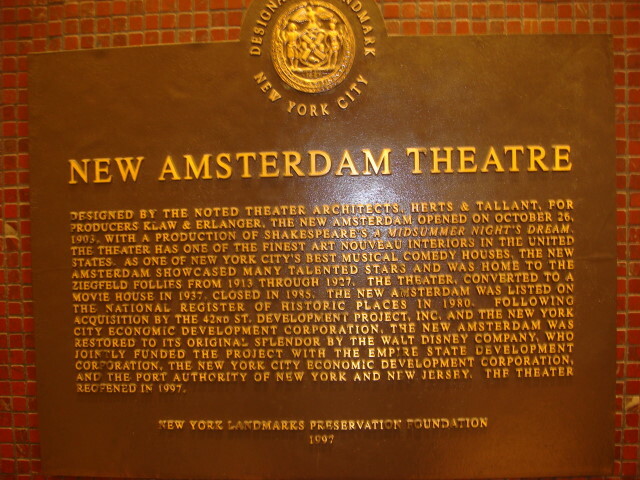 It used to be called the Theater for the Blind. I’ve never seen any of their productions, but I figured it would be an interesting interpretation. And it was. It was more than that. It was terrific. I’m not that fond of the play itself (I just don’t enjoy the storyline that much), but their production was nicely done. You see, they didn’t really play off the idea of the disabilities, but their real gimmick is that they were only going to have four actors playing all of the parts. That meant that each actor would handle eight or more rolls. And, on occasion, both rolls are on stage at the same time. Talking with each other. And you ain’t seen nothing til you’ve seen a blind actor doing quick costume changes to talk with himself…and one of “himselves” is a woman. Kudos. 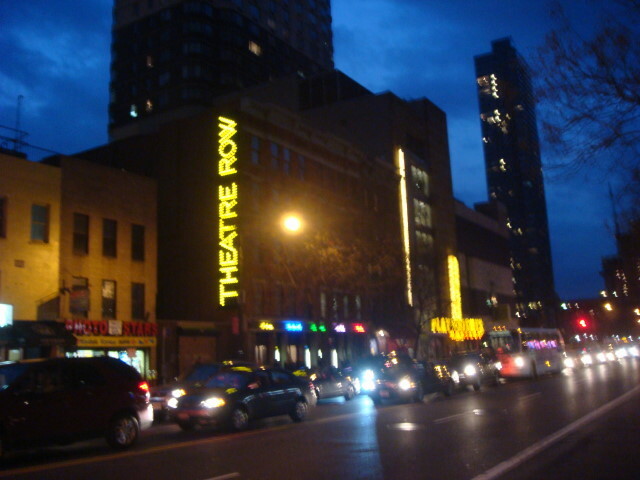 The show is at Theater Row in Hell’s Kitchen, 42nd Street between 9th and 10th Avenues. It is my favorite off-off-Broadway venue. 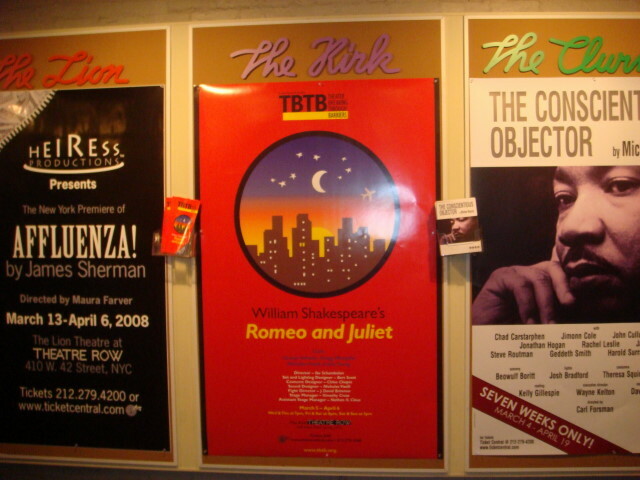 It holds a number of separate smaller theaters (kind of a live theater multiplex) and this play was in The Kirk. It holds about 100 seats. I could only tell disabilities in two of the actors, there was only one blind guy and one who has cerebal palsy. Another great part is that there was no quarter given to them on account of the disability. The actor with CP (Gregg Mozgala) had to jump about the stage in his role as Romeo. The blind actor had to wander the stage and pick up stuff at one point and sword fight at other points. The Kirk’s inside before the beginning. If you look carefully, you may see the wires across the stage floor. They were used as marks for the blind actor (George Ashiotis). When he did his switching of roles, it was great. He did conversations with his off-stage self and would go back and change during it. But the best switching was done by the lone female (Emily Young). For a long conversation between Juliet and Paris (she playing both parts), she kept walking back and forth behind a barrier (just behind the small box at the center in the picture above) and putting up her hood to show that she was Paris, or down to show that she was Juliet. And she kept them straight. I think we were all at the edge of our seats waiting for a slip, but there was none. And I say all of this and Nicholas Viselli and Emily Young are probably amazed/amused that I didn’t spot their disabilities (if they have any). But disabilities weren’t part of the play (although I kept hearing lines about blindness and light that I hadn’t noticed before). And that was the great thing. 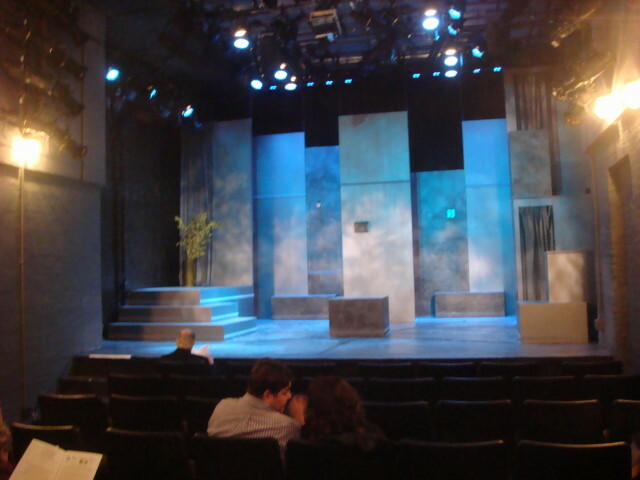 I went to the play expecting to have them put out the lights for a large portion of it to force the audience to “see” the play the way a blind person would, but got a straight-out production of Shakespeare that ignored any limitations. 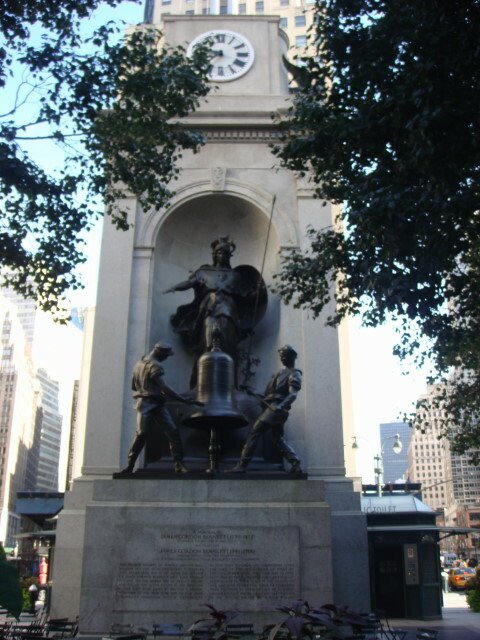 Just a short post to point out a famous landmark in Manhattan: Herald Square. 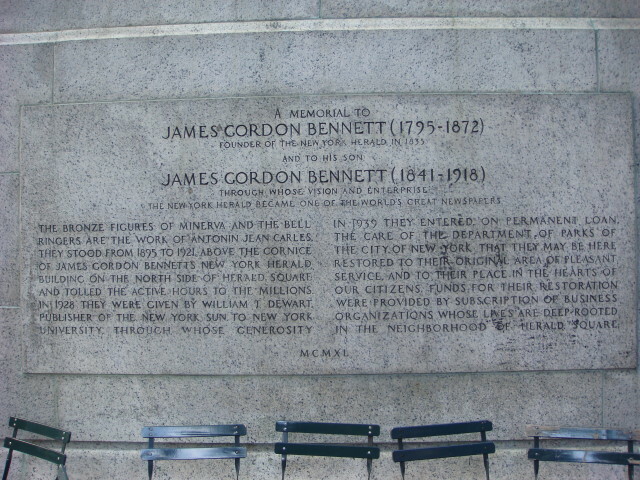 You know it from “Give My Regards to Broadway” by George M. Cohan and the line that says “remember me to Herald Square” sung by Jimmy Cagney (okay, that was in the movie “Yankee Doodle Dandy”). But, what’s the deal behind it? 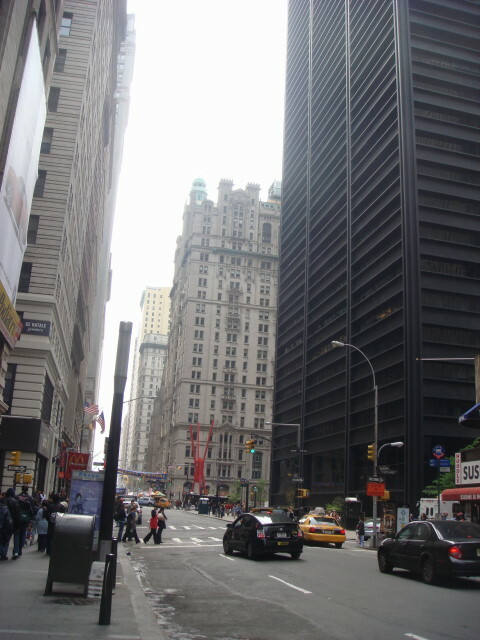 Most of Manhattan is laid out in a grid with the streets going east-west and the avenues going north-south. 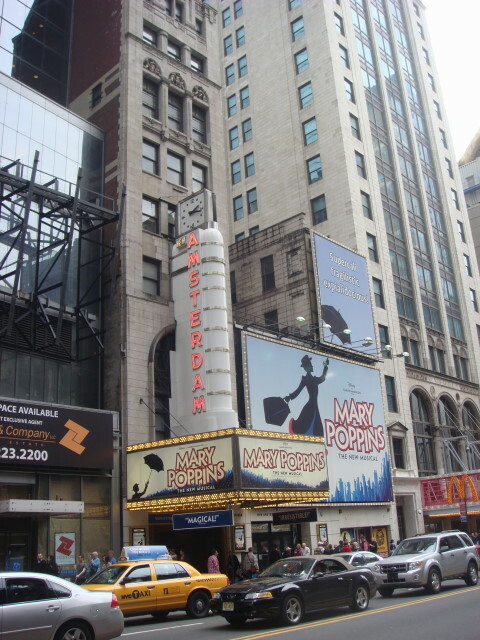 There’s the one big exception: Broadway. 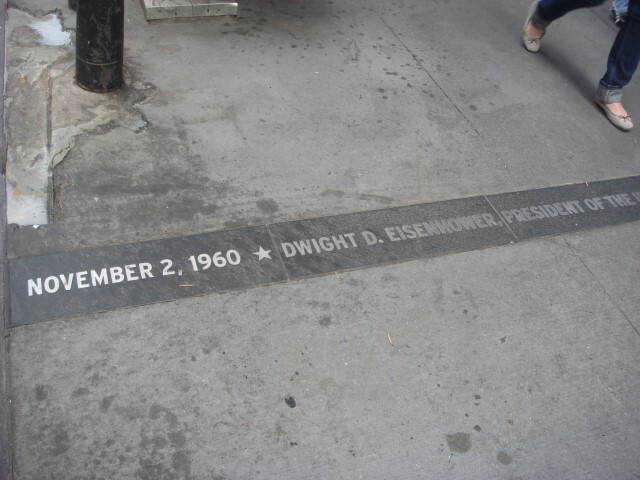 Broadway goes mostly north-south, but with an east-to-west drift. 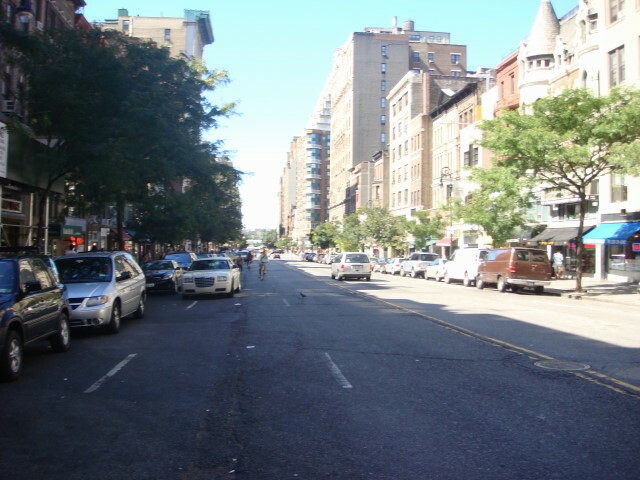 The grid makes square blocks, but everytime that Broadway crosses an avenue, it causes one of more “splinters” of the blocks to be left over and those bits and pieces are called “squares”. I’ve yet to see one that’s square, and most of them are pretty much smallish islands. 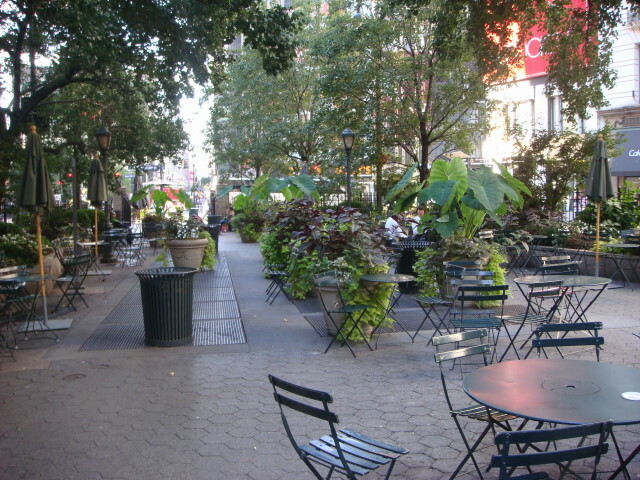 Of course, Times Square is the most famous (where Broadway crosses 7th Avenue), but Herald Square is probably second (where Broadway crosses 6th Avenue). Here’s a picture of it from just north. Nobody would call it big, but they have put some effort to making it look good. 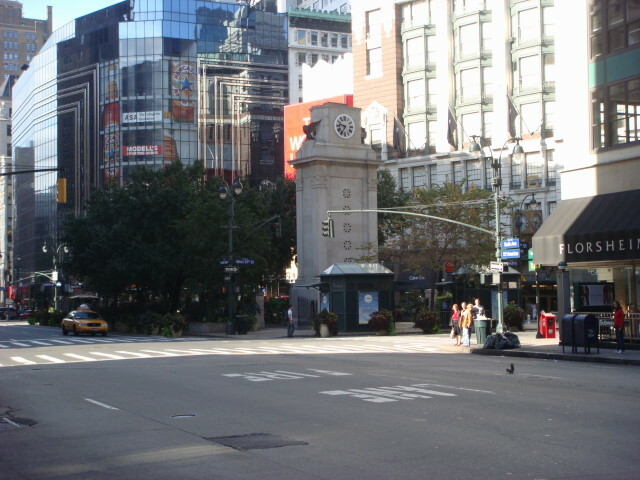 The square is named after the old newspaper “The New York Herald”, just like Times Square is named after The New York Times. Well, the Herald is long gone, but the Times is still around (however, the Times is moving its operations a little more distant from its current 43rd Street location to 41st Street and a bit further west from where it is now). 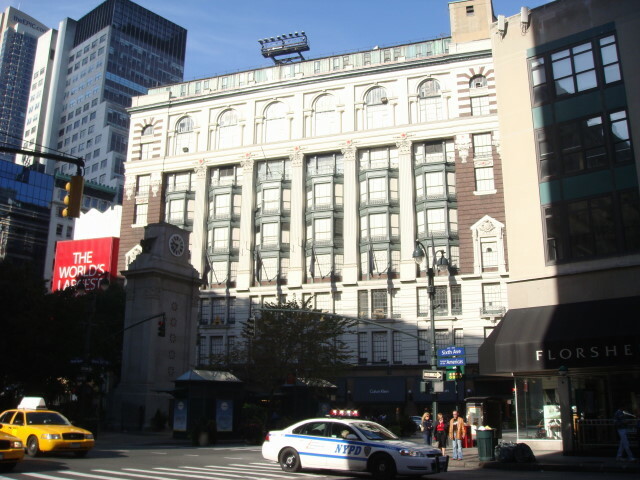 Anyway, Herald Square does have a famous neighbor: Macy’s. 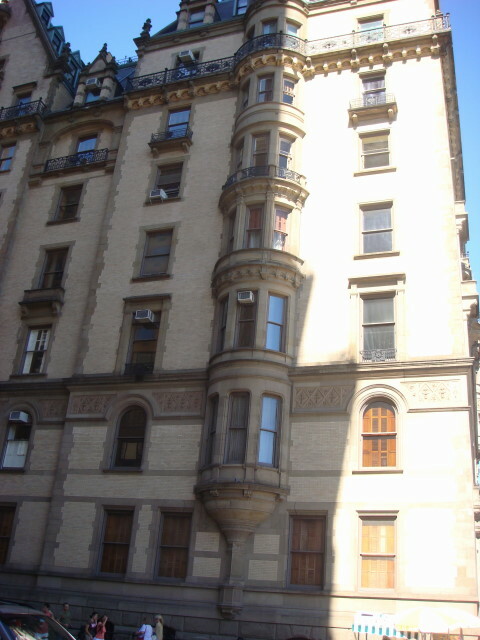 The square’s tower is a monument and celebrates…the New York Herald (actually, its founders). 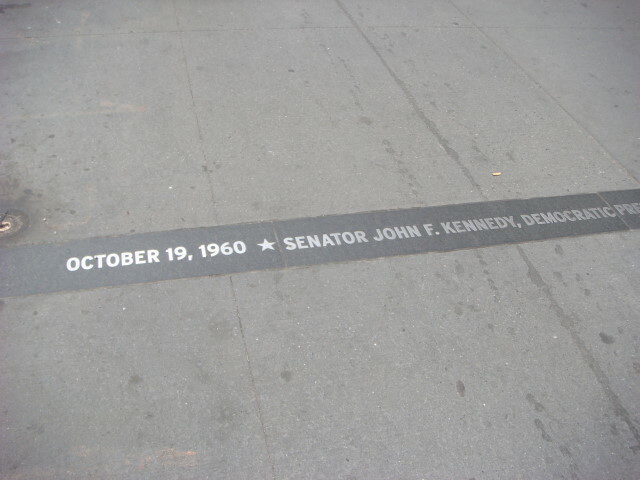 A closeup of the plaque at the bottom. You may need to click the picture to be able to read it. 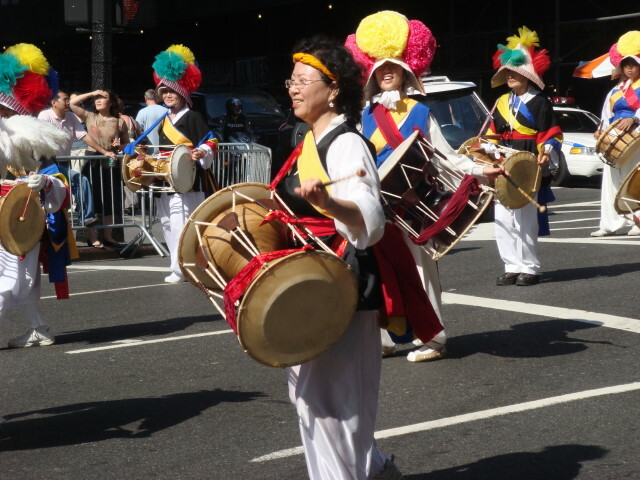 It was a Saturday and the Korean Parade was set to go. Therefore, so was I. 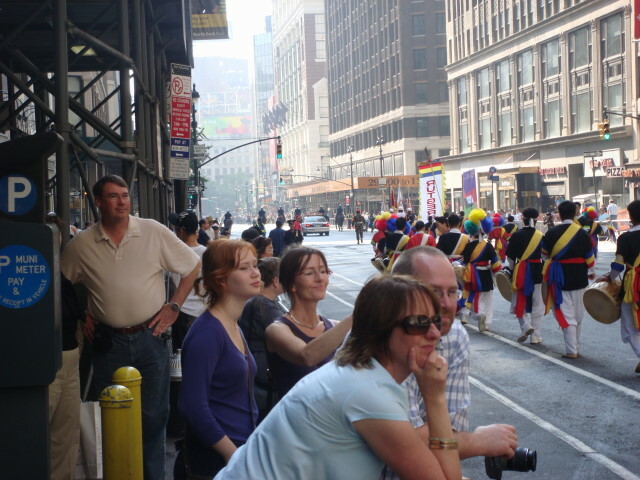 The day was bright and sunny and I was interested in the parade in an odd way simply because it was on Broadway and I don’t recall having seen one on that avenue before. 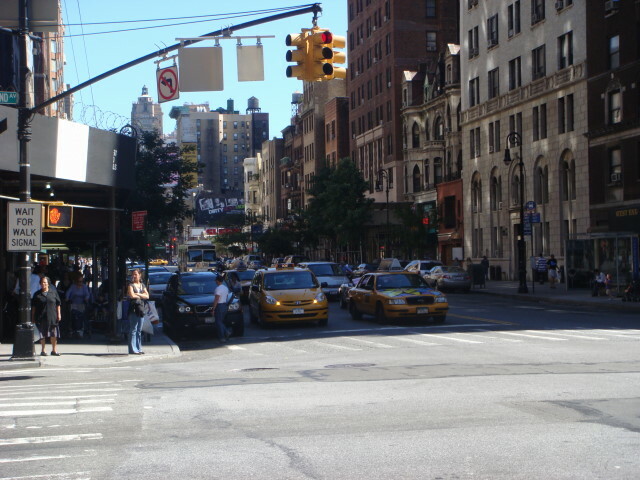 (There’s a sort of heirarchy of parades where certain avenues such as Fifth get the biggest and the smaller ones go to other streets such as Madison and 2nd and 6th.) 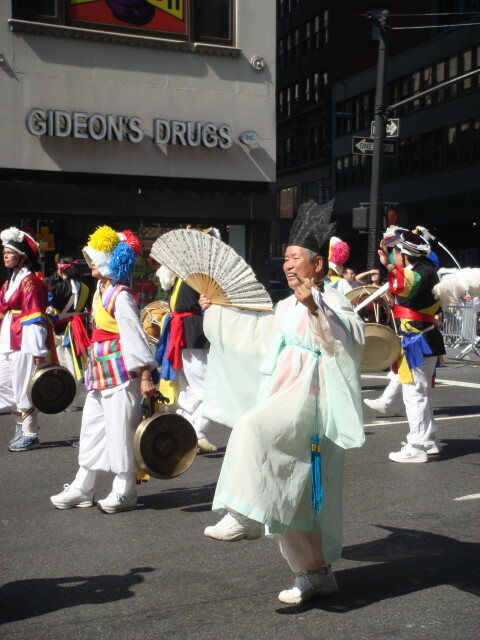 There had been no publicity about the Korean Parade that I was aware of, which for me tends to mean a small parade which is often very interesting. 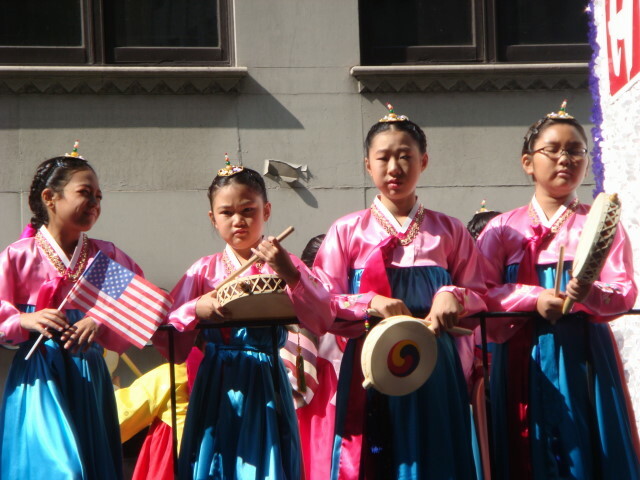 Yet, there really isn’t a big link that I’m aware of between mid-town Broadway and the Korean community. There is a huge community out in Queens and I’m sure many live in Manhattan, but I was wondering why they weren’t holding it in Queens. 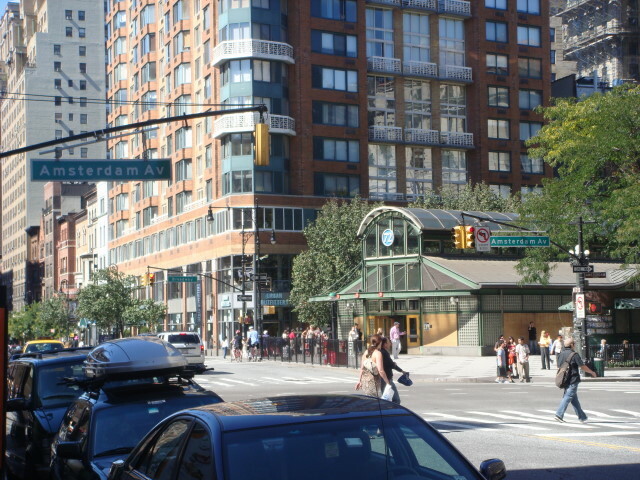 (On the other hand, I don’t think many Nigerians live on Second Avenue, but their consulate is there and is probably a hub of their social network.) 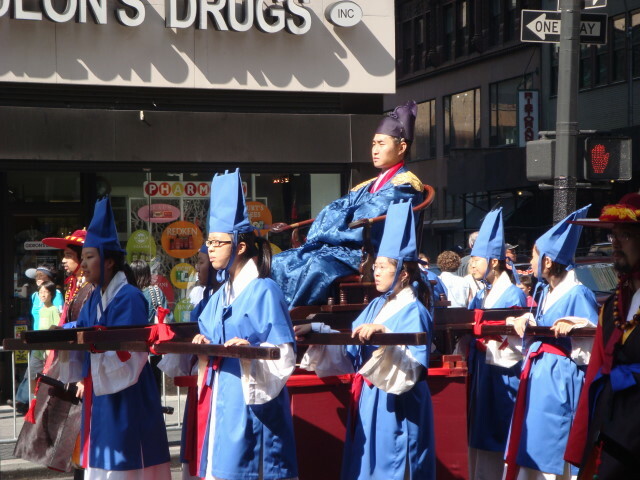 Nevertheless, I expected to see an interesting parade with some very interesting displays. The parade started just about on time with the usual “cops on horses”. 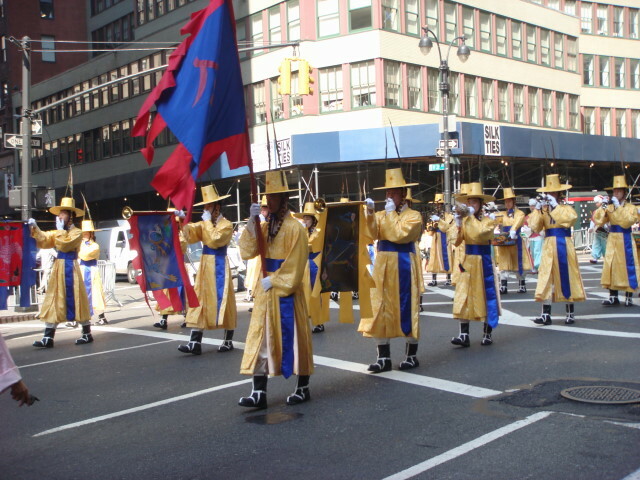 The parade was from 41st Street down to 23rd. I was at 37th. The day was a bright and sunny day, but I had positioned myself in a shadier area. Later, as the earth kept turning and the sun kept creeping in, the brightness would become an issue. There were really two signature parts of the parade. 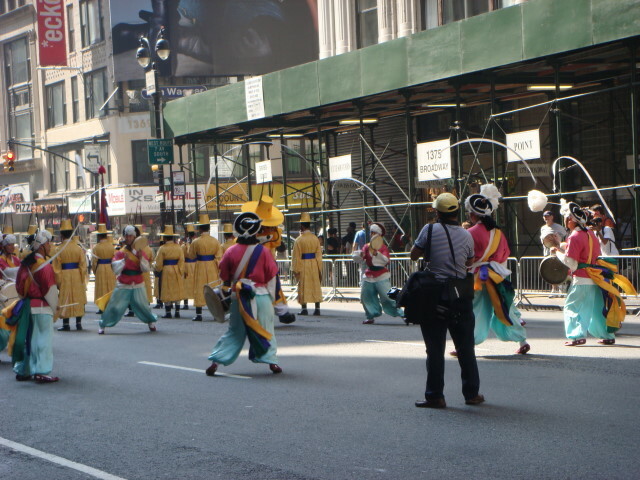 Well, maybe it’s better to say that there were two sights in the parade that I found more interesting than the others. First, was what I can only refer to as the “head whirl”. 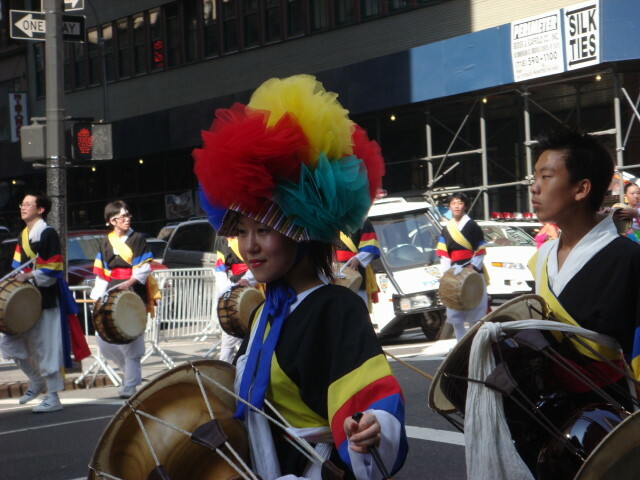 This was a marcher who had a sort of whirligig on his/her head that had a long white ribbon. By twisting the head just right, the ribbon would circle the user. It was a very nice visual. 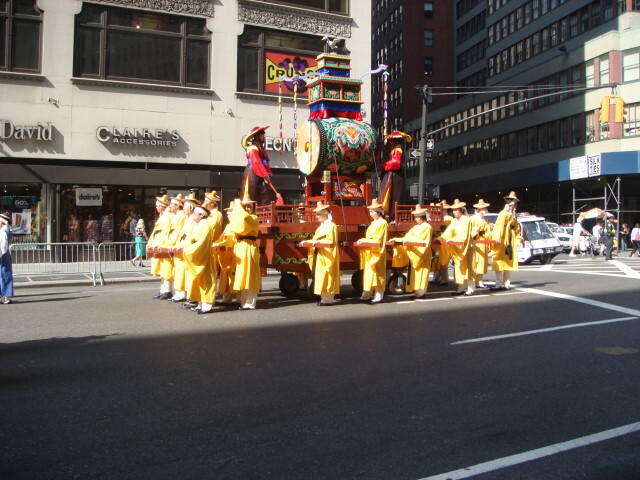 Later in the parade, there would be a number of the headwhirlers walking together, appropriately spaced out of course. 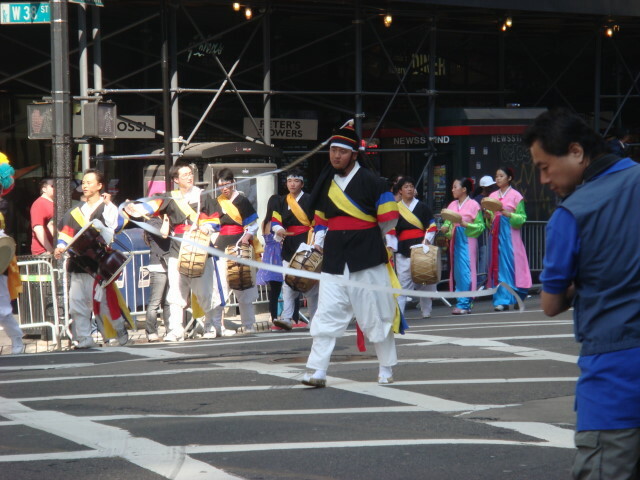 A common sight and sound during the parade were the drummers. In the below case, wearing a hat/headcovering that was very colorful. The music was pleasant, the drumming was very good; but the crowd was sparse. Note that the crowd wasn’t particularly Korean, either. 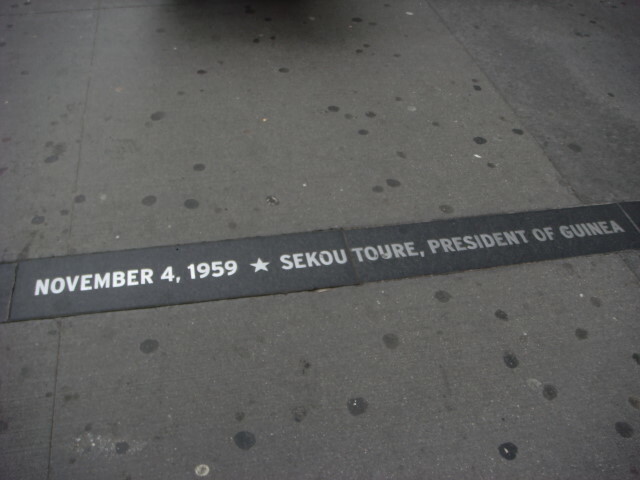 It wasn’t quite as lopsided as the Nigerian Parade (where I think maybe I saw very few Nigerians who weren’t in the parade), but there were very few Korean nationals in the crowd. The usual dignitaries did arrive. As usual, I’ve no idea who they are. I didn’t see a single New York politician participating. 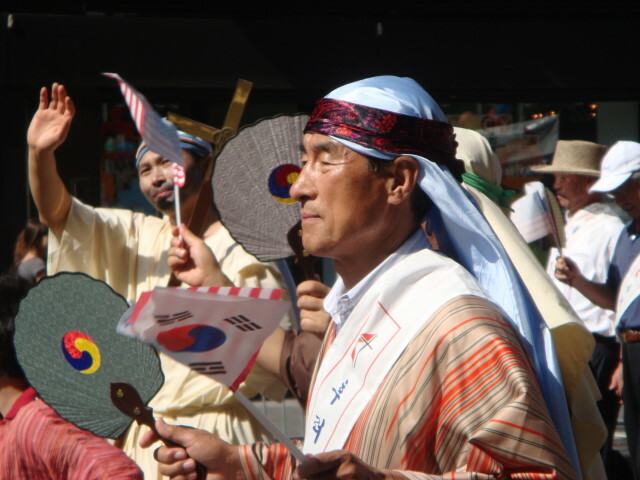 There were a number of social groups that participated. 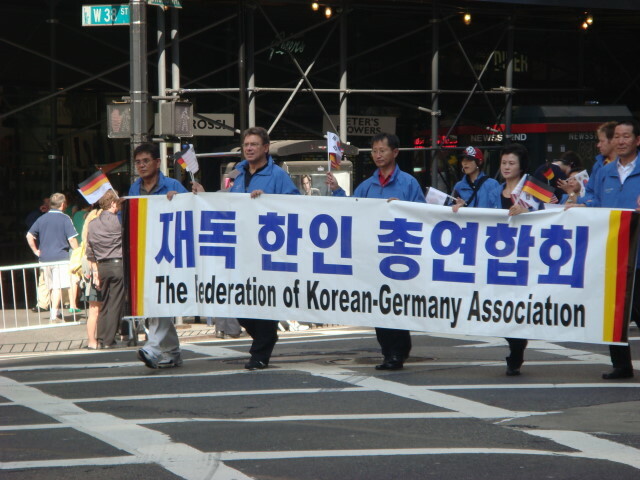 Among them were the Korean-Germany Association. 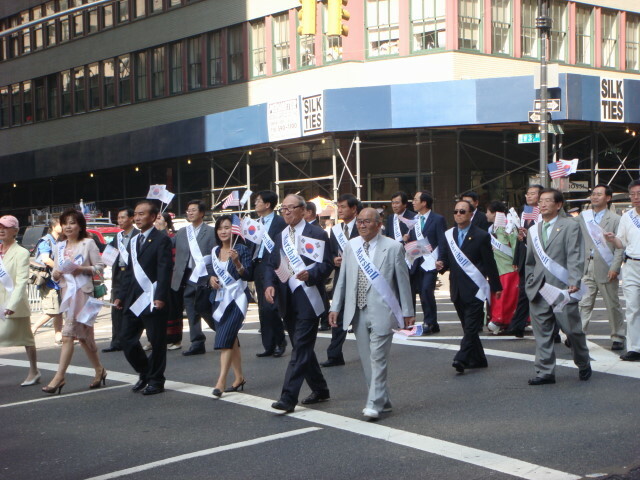 Another group was the Sygnman Rhee Association that commemorates the first post-WWII Korean president. 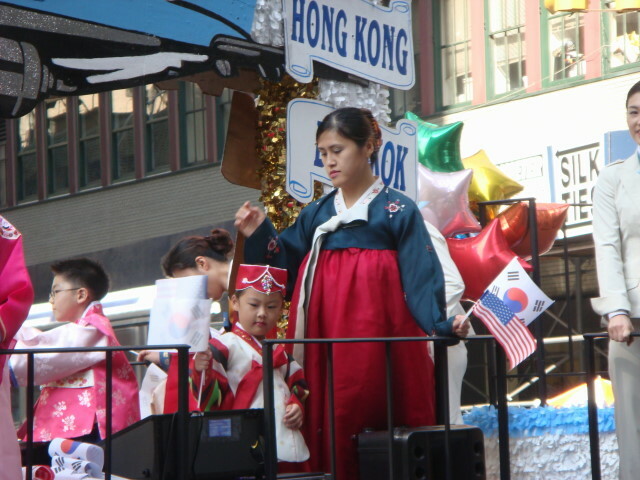 There were Korean-American police officers, a group that maintains cultural ties for Koreans adopted by Americans, and Korean Air had a nice float (pic below). 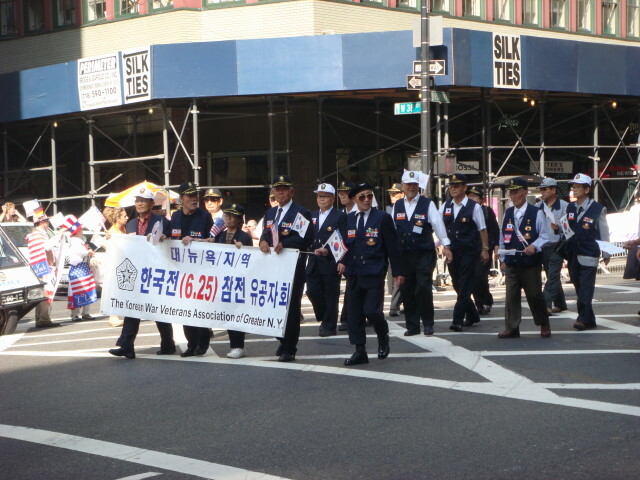 My favorite group was this bunch: Korean War Veterans. Technically, the war continues but this group may have taken part in that incredible 1950-53 part of the war. 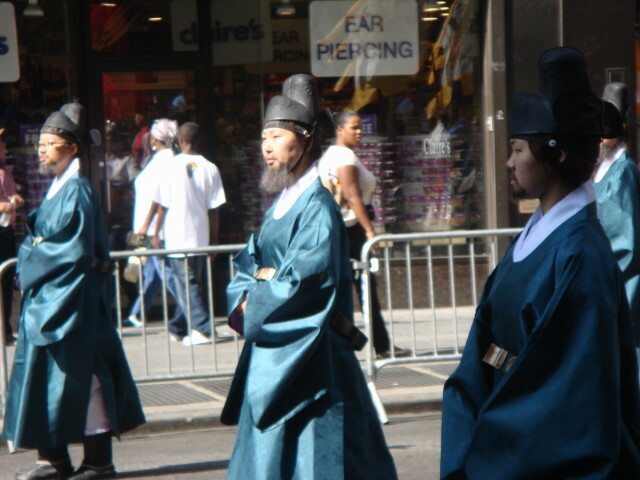 Getting back to the “signature” parts of the parade, the second most arresting visual was something that was called “The Royal Procession of Great King Sejong”. It took up the entire middle part of the parade. 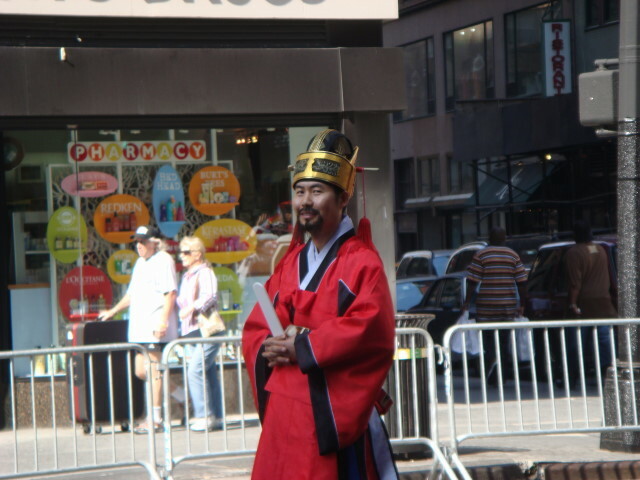 There were two characters who may have portrayed the Great King, but neither was marked as such. Here are some pictures from the procession. The horns they were playing gave out sort of a kazoo-sound. Actually, it sounded much better than that, but that’s the closest I can describe it. 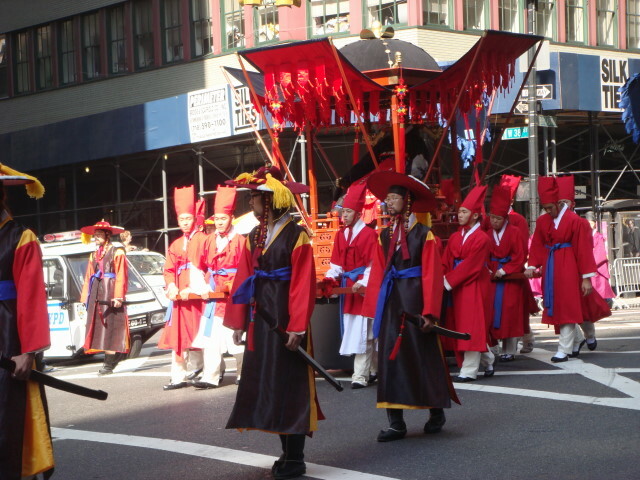 This section was a very solemn procession, but I did catch one guy showing some personality. But note the paucity, even the absence of viewers behind him (on the sunny side of the street). During this time, some of the head-whirlers gave a display. Very well done, but impossible to really capture in still pictures. And, probably, one of the Great King characters. Later, another figure may have also been the King. I often talk about the “men in skirts” phenomenon. They sort of had it here, but they were more robes than a native dress that resembled the modern skirt. I’ve also mentioned a character with a beard wearing a skirt (and parrot and tie-dyed dog): not seen at this parade. But this was a new one: women in beards. They looked like they were portraying ancient scholars. I don’t know if they’re being women was important to the storyline or whether they just needed people in the march. Doesn’t matter, but it is still unique in my experience. Part of the procession had a large drum with one person at each end banging on it. It sounded good. But, once again, note the absence of a crowd watching. An auto company had a car with a woman in national dress. 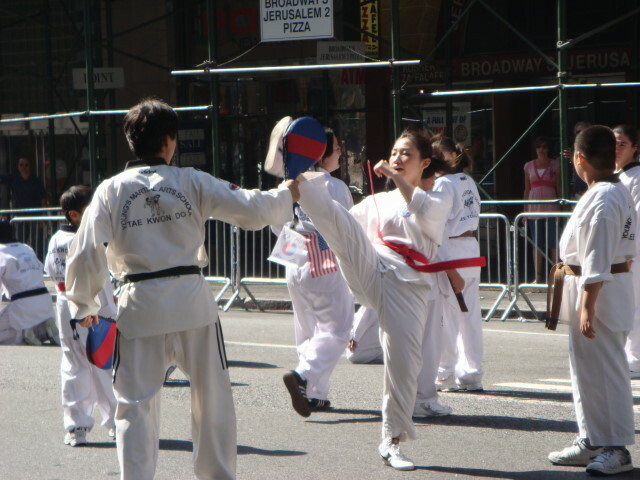 There were several martial arts displays. The age ranges were generally pretty young. The pictures above and below are two of my favorites. It’s all about their attitudes. Four girls, four attitudes. And the little boy looks ready for any trouble that may come his way. And the drummers were everywhere. I liked this character. He was having a grand time. 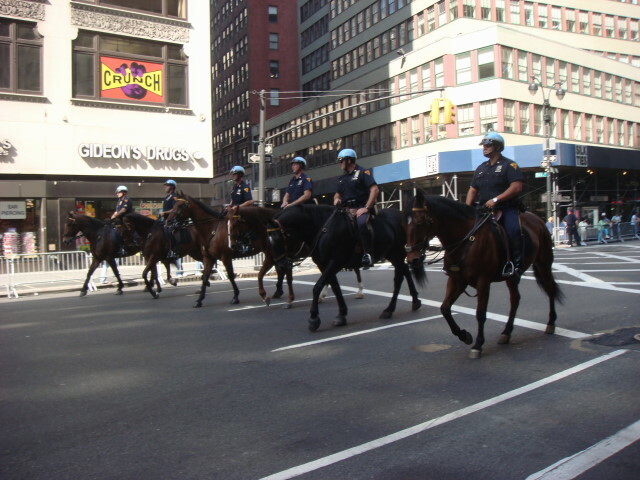 And cops weren’t the only ones on horses. But probably my favorite visual was this picture. It just shouts out something very…Korean. An ancient and deep culture. 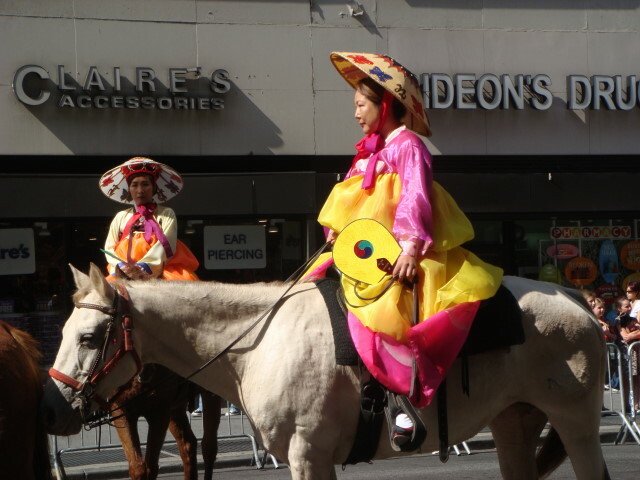 It was a long parade with lots of pagentry and color. Overall, it was an excellent display, but to so few of us that it loses a lot of its power. I always say that much of a parade’s appeal is in its audience. The two spectacles feed each other and make each other better. Speaking of this, being New York there had be “another”. 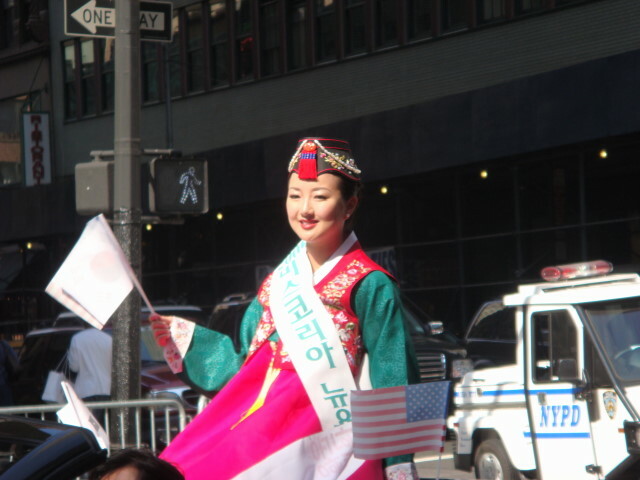 During the parade, I saw one nearby member of the crowd occasionally going out into the parade and taking pictures. He had a tripod, seemed to “belong” out there, but didn’t appear to be an official photographer. Right after I saw the “women in beards”, he and I talked (I wanted to make absolutely sure they were women because I was seeing them from a little distance, despite my camera zoom). It turns out that he’s originally from Russia and goes to all the parades! Kind of like Famous Ankles (excepting being Russian). We compared stories and it turns out he’s gone to a lot of the same parades as I have, although he’s more interested in the native costumes and cultures rather than the actual parades. His photos are strictly for his own viewing and he takes far fewer than I do. Nevertheless, we both agreed that the day, although beautiful, was way too sunny and set off too many shadows that didn’t photograph well. I took tons of photos (actually more than 300), but there’s absolutely no room for such volume here. This weekend has two more parades and we each intend to go to both. 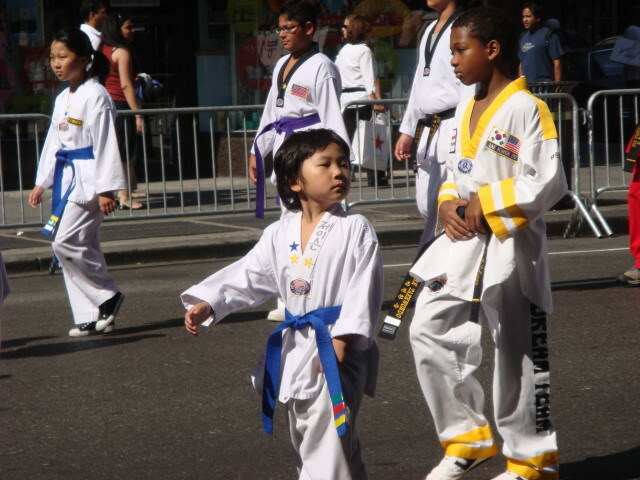 I doubt we’ll see each other as they are much, much larger than the Korean Parade. But, it was nice meeting you Victor. Have fun.